Today, I got pie in my face! But it was a for a good cause! Let me explain. 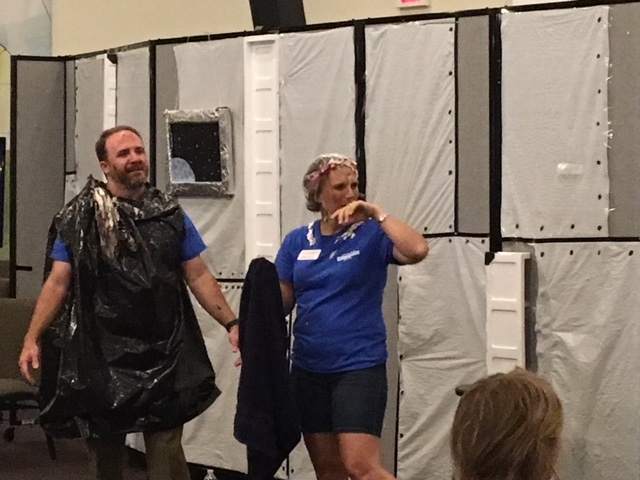 Cornerstone just wrapped up its 4th annual Vacation Bible School week. It was a wonderful week as over 70 children and 40 plus leaders gathered to have fun and learn about Jesus. Special thanks to our directors Lauren Davenport and Paige McClure who did a fantastic job. One of the wonderful things that our VBS program does every year is focus on missions. This year the focus was on the church’s work with Sacred Road Ministries on the Yakama Indian Reservation in Washington state. Our leaders contacted Sacred Road and asked them how our children might help raise money for a project to help the Yakama children. The leaders with Sacred Road suggested that our children could help raise money for a new Gaga Ball Pit. Gaga Ball is a HUGE hit with Cornerstone children and it is also a big part of the children’s ministry on the reservation. To motivate the children to give, it was agreed that if the boys raised more money than the girls then Paige would get pie in her face. If the girls won, then I got pie in my face. Can you believe it was a dead tie? Well this year I’m very proud of our children for raising over $500 toward the purchase of building an industrial structure. The total project cost will be around $2000. A generous donor has agreed to supplement the remaining balance to reach $2000 to complete the project. Praise God. Below is a picture of what this game and structure is like. Please keep praying with me for fruit from these wonderful ministries. Helpful article regarding the overture on marriage at GA this summer.